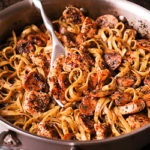 Chicken Pesto Pasta in Creamy White Wine Sauce - What's In The Pan? Chicken Pesto Pasta in Creamy White Wine Sauce is a family favorite pasta recipe! 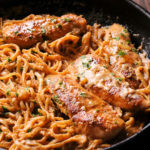 This easy pasta dish is full of savory flavors and a delicious, creamy, white wine sauce that’s ready in under 30 minutes! It is so delicious with flavors of basil, thyme and oregano and so easy to make! 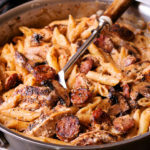 I made them all – Cajun Chicken Pasta, Lazone Chicken Pasta, Louisiana Chicken Pasta! This time I’m going for pesto chicken pasta recipe! 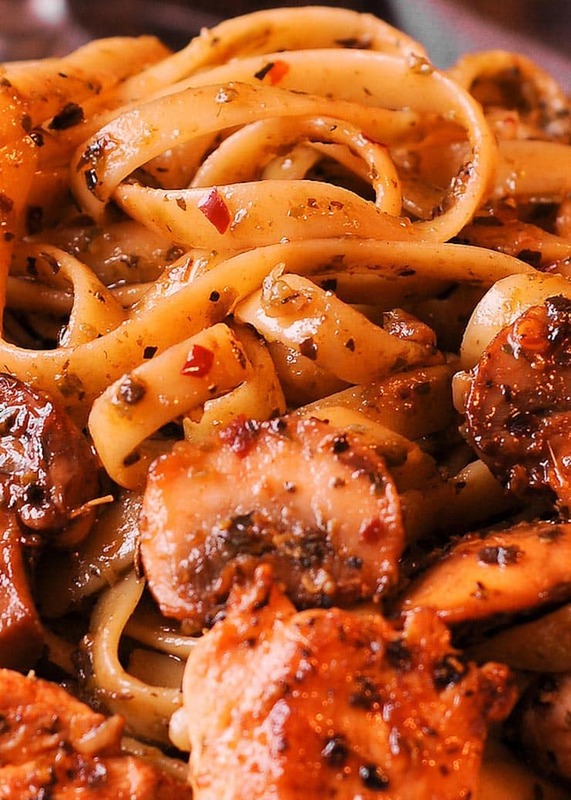 Chicken and mushrooms are tossed in the pesto white wine wine sauce with just enough pungency from garlic. There you have a rich and savory dish bursting with herb flavors! And you can easily put this gourmet level meal on the table in only 30 minutes. This easy pasta dish is all about savory pesto white wine sauce tossed with perfectly cooked chicken and mushrooms. Seasoning is very important here. Even though the recipe calls for Italian seasoning, but I also like to use Sicilian seasoning. The major difference between the two s is the presence of red pepper flakes and roasted garlic in the Sicilian seasoning. That’s why red pepper flakes and garlic are added in the recipe. But if you do have Sicilian seasoning, just use that.. I used Pinot Grigio, which is a dry white wine. Other white wines, such as Riesling or Chardonnay, will be good here too. 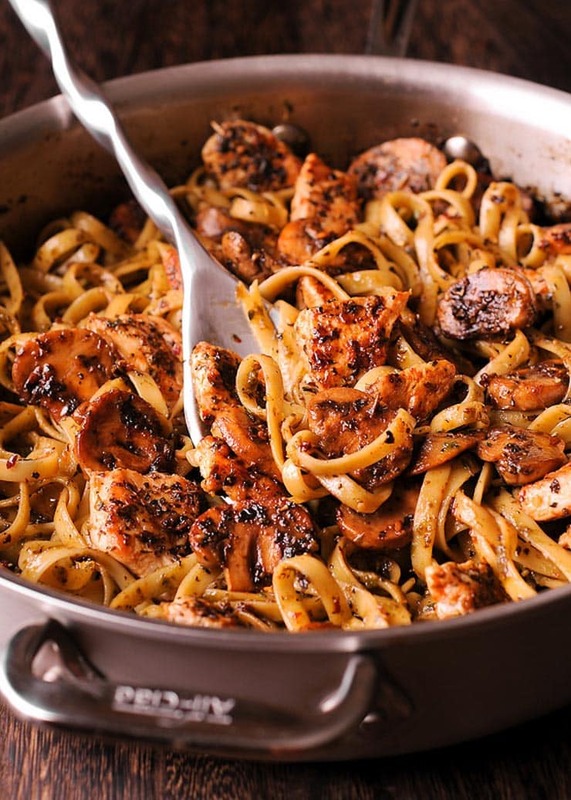 Made with white wine, butter and olive oil, this delicious Chicken and Mushroom Pasta brings out the best flavors out of chicken and mushrooms. Perfect for busy weeknights! What kind of pasta to use. I love using long ribbon pasta with pesto dishes. Good choices are fettuccine, linguine, pappardelle or tagliatelle. In my opinion it’s easier to make this Pesto Chicken Pasta look good when using long ribbon pasta. Even though penne might be a good choice as well. 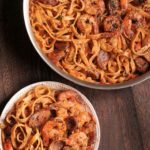 Quick and easy to make, yet fancy enough for guests, this pasta dish is so simple! 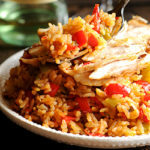 It can become a favorite weeknight dinner. In terms of pesto, use homemade or store-bought pesto! Nowadays they sell a variety of really good jarred pesto sauces in the stores. I try to buy a small jar of high quality pesto in order to use most of it within a couple of weeks. Once opened, pesto does keep pretty good in the fridge. Pesto of course is as a classic Italian favorite. It’s the combination of fresh basil, pine nuts, olive oil, garlic and Parmesan cheese that is hard to beat in flavor. Some pesto sauces out there have lemon, capers or even crushed red pepper to give it some heat. I like pesto sauce that is thick and more like a gravy with lighter amounts of olive oil mixed into the sauce and not a big fan of pesto swimming in the oil. However, pesto sauce did not gain popularity in the United States until the 1980s and 1990s, partly because fresh basil was not sold here until the 70s. So basically it’s still pretty new to most of us! Chicken Pasta in Simple Pesto White Wine Sauce is so delicious with flavors of basil, thyme and oregano as well as pungency from garlic, you simply can't go wrong here! Heat 1 tablespoon of olive oil and 1 tablespoon of butter in a large skillet over medium heat. Add chicken chunks to the hot skillet, generously season them with salt, pepper and Italian seasoning right in the skillet and cook for about 4 minutes on one side, flip once and cook for 2 additional minutes on the other side. In order to not overcrowd the pan I cooked chicken in 2 rounds (this avoids overs-teaming it and ensures proper browning). Because the pan will be hotter on the second round, reduce cooking time for chicken to 2 minutes per side. Add a splash of olive oil to the second round of cooking chicken. Remove cooked chicken from skillet after each round. Add second tablespoon of olive oil and second tablespoon of butter to the now empty skillet. Once the pan is hot, add sliced mushrooms, generously season them with salt, pepper and Italian seasoning right in the skillet. Cook the mushrooms on medium high heat without flipping for 2-3 minutes until mushrooms release liquid and get soft. Pressing down with spatula will speed up the process. Flip to the other side and cook for 1-2 minutes. Remove mushrooms from skillet. Add minced garlic to the now empty skillet and cook until fragrant, about 1 minute. Add 1 teaspoon Italian seasoning, 1/8 teaspoon red pepper flakes, 1/2 cup wine and cook on medium for 2 minutes to reduce wine. Now add 1/2 cup basil pesto and 1/2 cup chicken broth. On medium heat, mix everything to combine. Continue cooking for 3-4 minutes until the sauce reduces. Reduce the heat and add salt and 1/2 cup of shredded Parmesan. Slowly mix it in until it's evenly incorporated with the sauce. Taste the sauce and adjust seasoning if necessary. In the meantime bring a large pot of salty water to boil, add pasta and cook it according to instructions. Drain the pasta, but do not rinse. Add pasta to the skillet with the sauce, and stir until pasta is fully coated in sauce. Add chicken and mushrooms. Mix with pasta and sauce. Taste and season with more salt if necessary. Awesome recipe. Tastes so good, will become a regular meal at my house! I’m so glad you enjoy it at your house! This was very good. Whole family enjoyed. I used a different pasta and increased proportion but kept to recipe. Made this tonight and everyone absolutely loved it! I made my own basil pesto but my dish came out more green then pictured above. I’m so glad you enjoyed it! I bought my pesto in the store and it was not nearly as concentrated, green or as fresh as yours. I believe that’s the reason for color difference. Mine was definitely diluted. I prefer dark meat, can boneless, skinless chicken thighs be used instead? Sure, they can be used instead. I find that thighs are much more forgiving during cooking. They will give a nice color to the dish too. Made this. Super yummy! You could also add asparagus to it as well! I made it and added fresh basil into the sauce. Very delicious. Thank you! Sounds so good with fresh basil. I bet the the smell in the kitchen was wonderful. perfect for winter…love chicken and mushrooms together – this is delicious!